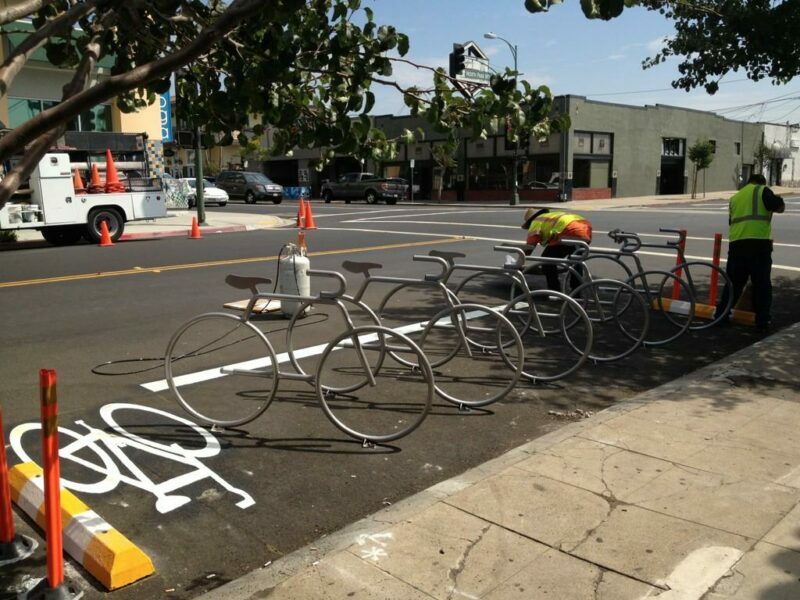 San Diego’s third bike corral is currently in the process of being installed in front of The Linkery. I love the design of the corral and the placement of the corral. What are your thoughts? For more about The Linkery and its proprietor, Jay Porter, read this interview conducted back in 2009. To send your notes of gratitude to Councilmember Gloria who is certainly turning out to be one of the most bike friendly Councilmembers in the City, you may reach him at all your social media outlets or via email. I’m happy to spread the love to rest of the Councilmembers, but Councilmember Gloria is being the trailblazer so everyone else has a bit of a climb to catch up. County Supervisor Ron Roberts was also a big part of this installation. The North Park Main Street received a grant from his office to purchase the racks that look like bikes, it was a significant investment and should be recognized. The three installations have been a shared project with the Business Improvement Districts/Community Parking Districts and the City and now, in North Park the County. I’ve sent in my note of thanks to Supervisor Roberts and I hope you consider doing the same. Here is a photo taken a few days after the ribbon cutting ceremony. And a good bike party time was had by all. Perhaps of especial note were the bikes supplied to Business Improvement Districts participating in a bike friendly BID plan that was also trumpeted at this bike corral opening. The bikes were step through three speeds with front rim brakes, rear coaster brakes, rear rack, front basket, wide 559mm (beach cruiser size) tires and wide seats. Since most business improvement districts are relatively flat, this is a good choice for a short range office chore bike. These are going to get ridden by someone who’s not touched pedals in decades (there was some sample riding by BID representatives that made me cringe and cheer, at least on the inside, in the same moment). Extra special good job on the rack and basket. I can see those being used for a sandwich run. North Park – Mid-City Regional Bike Project – Community Input Wanted! Live in North Park, City Heights, University Heights, Normal Heights, Rolando or other nearby areas? Like to ride a bike? Like to ride a bike without fearing for your life?